Subject:Campsite of emigrants on the Oregon Trail. 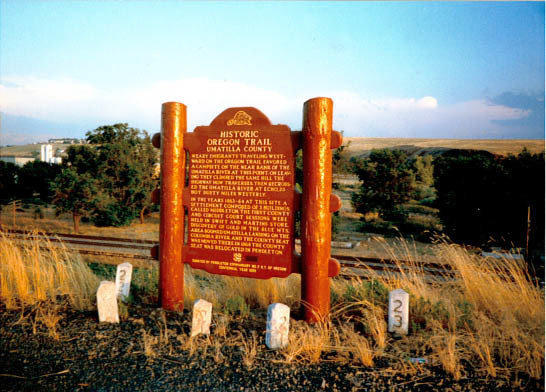 Weary emigrants traveling westward on the Oregon Trail favored a campsite on the near bank of the Umatilla River at this point. On leaving they climbed the same hill the highway now traverses, then recrossed the Umatilla River at Echo 20 hot, dusty miles westerly. In the years 1863-64 at this site a settlement composed of 3 buildings called Middleton, the first County and Circuit Court Sessions were held in Swift and Martins Store. Discovery of gold in the Blue Mts. 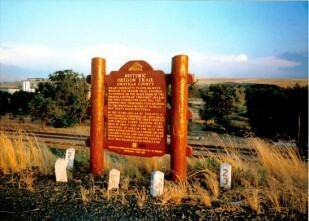 Area boomed Umatilla Landing on the Columbia River, and the County Seat was moved there. In 1868 the County Seat was relocated in Pendleton.